Nature is not a temple, but a workshop, and man’s the workman in it. Whatever a man prays for, he prays for a miracle. Every prayer reduces itself to his: ‘Great G-d, grant that twice two be not four. 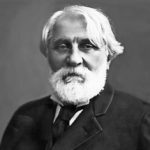 Ivan Sergeyevich Turgenev was born in Oryol, Russia. He was a Russian novelist, short story writer, and playwright. He studied at the University of Moscow, the University of Saint Petersburg(Classics, Russian literature, and philology), and the University of Berlin(philosophy). He wrote several novels include: Rudin, Home of the Gentry, On the Eve, Fathers and Sons, Smoke, Torrents of Spring, and Virgin Soil. His Selected shorter fiction include: The Diary of a Superfluous Man(novella), A Sportsman's Sketches(short stories), Mumu(short story), First Love(novella), and Klara Milich(novella). He wrote several plays include: A Provincial Lady, A Month in the Country, and Fortune's Fool.